Spilled hot beverages and sticky stuff on a laptop keyboard? Forget all the keyboard pain with this virtual keyboard from Brookstone. 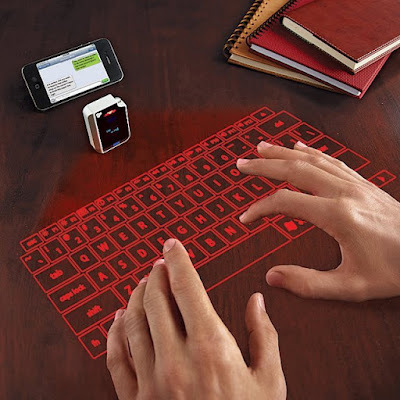 It uses lasers to project the keyboard on any flat surface. You touch, and the small device has powerful optic sensors that pick up and transmit the data to your smartphone, tablet or laptop using Bluetooth.